This article will walk you through how to update the operating system (iOS) on your iPod touch, iPhone or iPad. If you have iOS 5 or later, updating iOS can be done differently than on iOS 4 or older. Before you attempt an update, you may want to double check that your iOS device is compatible. Older devices may not be able to get the latest and greatest, as their hardware cannot support certain features. If iTunes tells you that the version you have now is the current version, there is no other way around this. If you have an iPhone 3GS or a 3rd generation iPod touch, and iTunes says that iOS 4.2.1 is the latest, then you actually have an iPhone 3G or a 2nd generation iPod touch. This is an easy mistake to make, as the iPhone 3G and 3GS, and the iPod touch (2nd and 3rd generation) look the same on the exterior. There is no 8GB model of the 3rd generation iPod touch, so if yours is 8GB, it's probably a 2nd generation. If there is an update available for your device, you can only download the latest version available. For example, if iOS 4.2.1 is the latest for your device, you cannot update to 4.0, only 4.2.1. If you have concerns about the latest update, for example, bugs in the software, do not worry. Apple software updates are thoroughly tested, and in fact, most actually fix bugs. Apple encourages you to stay up to date to get bug fixes and new features. Those who say they are experiencing bugs will usually find they are not related to the update, and you can mostly find such concerns in technical support forums. Keep in mind that not that many people come to a tech support forum to share good experiences, and only post if they are experiencing problems. There have hardly been any bugs that have affected more than 1% of users. If you restore your device, the latest update will also be applied. If iTunes tells you that your software is up to date but you are certain that you are eligible for a newer version, you may need to update iTunes to a version that supports a newer version of iOS. The latest version of iTunes is always available at http://apple.com/itunes/download/. If your device gets replaced, it may have an older version if you ever updated iOS. If you wish to restore the new device from a backup made on a newer version of iOS, you will first need to update. Below is a list of devices and what version of iOS they originally shipped with. Note that your device may have had a later version when you first received it, but when these devices were first released, they had the version of iOS listed above. If you currently have iOS 4 or earlier, you will need to update by plugging into the computer and using iTunes. Devices running iOS 5 or later also have the option to update over the air, covered later on. Your device will need to be plugged in to a computer with the iTunes application loaded on it. If it is plugged in, you should be able to launch iTunes and locate the "DEVICES" column on the left. Under this heading, the name of your device should appear. If you click on this, a "Summary" tab should open, as pictured below. If you do not see the sidebar, see iTunes 11: Show Sidebar and Status Bar. Under the "Version" section, you can click Check for Update, and iTunes will check to see if your software is up to date. If there is a newer version available, the Check for Update button will be replaced with an Update button. If the Update button appears, you only need to click on it and iTunes will do the rest. iTunes will first perform a backup of your device, allowing your content to be restored after the update. iTunes will first need to download the update from Apple's servers. Note that if you own two or more kinds of devices (for example, an iPhone and an iPod touch), a separate software update will need to be downloaded for each (iPhone Software Update and iPod touch Software Update). After the update has been downloaded to iTunes, it will automatically begin to install it on your device. Your device should be plugged in during the whole installation process. A progress bar on the device will indicate how far along the installation is. When the progress bar is full and the device turns on and displays your apps, it is not yet ready to be unplugged. Most users who unplug their device at this point do not realize that their content has not yet been restored, and, as a result, lose all of their data. In iTunes, the status should be displayed at the top, and will indicate what is currently being restored (it may say "Restoring Apps," "Restoring Music," etc. ), and once the status in iTunes shows complete and displays the Apple logo, you may now unplug the device. As far as the time it takes from beginning to end, it could vary. If you download an update on the same day that it comes out, it may take hours, as millions of people are most likely downloading the update at the same time, putting stress on Apple's servers. If you are downloading an update that has been out for a while, with a normal load on Apple's servers, the download of the update may take anywhere from 10-20 minutes, depending on the size of the update. Once the update has been downloaded, it usually takes 5-10 minutes to install it on your device. Have iOS 3 or Earlier? Do I Lose Data when Updating? No, you don't. Step 1 of the update is a backup. You will only lose data if you update on an iTunes library that is different than the one you have used in the past for syncing. If you have content that is not in your library, or you got ahold of someone else's content, that will be lost unless transferred to iTunes. Users may only store music that they purchased with their own Apple ID or music from elsewhere that they own and imported to iTunes. Another possibility, as mentioned above, is if the device is unplugged before iTunes gives the all-done signal. But, if performed correctly, no data is lost. To avoid the possibility of losing data while connected to iTunes, users of iOS 5.0 or later can update over Wi-Fi, known as an over-the-air (OTA) update. The process is described below. 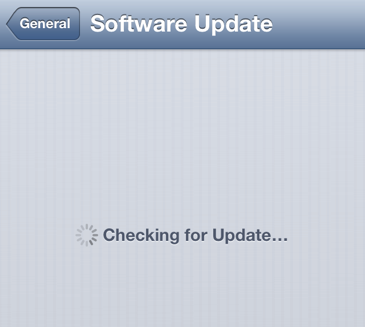 If you are running iOS 5.0 or later on your device, updates can be performed right from your device, over the air. Of course, you still have the option of updating in iTunes, but by updating from your device, you can avoid most of the potential problems users run in to when restoring in iTunes. If you are currently running iOS 4 or earlier, you will need to connect to iTunes to update. In order to update from the device, you will need to open the Settings app. From there, tap on the General menu, then on Software update. 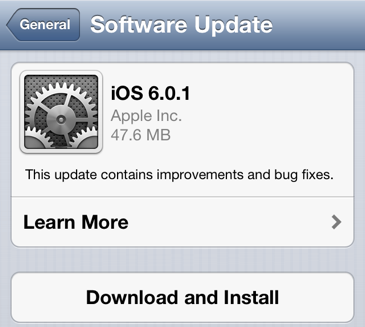 Again, the Software Update option will only appear in Settings on devices running iOS 5.0 or later. After the update has downloaded, it will install, and the device will then power off and a progress bar will indicate the progress. Updates over Wi-Fi are delta updates. This means that only the new features and changes will be applied, rather than reinstalling the entire operating system, which is more efficient and takes up less space when downloading. Attempting to downgrade iOS, or attempting to update on a jailbroken device will very likely result in an error. This is one of the consequences of modifying your software in a way that violates the iPhone's, iPod touch's or iPad's License Agreement. The best way to avoid having your device become a brick is to undo any such modifications. For more information, see What is Jailbreaking iOS? Should I do it?, and from Apple: http://support.apple.com/kb/HT3743. To learn more about this update, go to Settings > General > Software Update > About this Update on your device. This menu requires that iOS 5 or later is currently on your device. This article helped me more than talking to an agent on the apple site. I cant update my iPhone 3.... It has iOS 3.1.3. And i cant download any app... Can someone help me?